In the late nineteenth century, bicycles appeared on city streets, country roads, and race tracks. 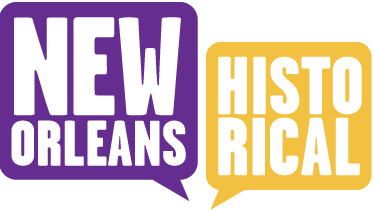 Cycle racing in New Orleans rose with a tide of interest in sports—recreational and spectator—among the middle class. In the summer of 1891, the Louisiana State Championship was held at the Fair Grounds race track. 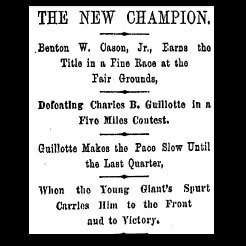 The young Benton "Babe" Cason, whose star had risen rapidly the previous year, challenged the established champion rider Charles B. Guillotte in the five mile Louisiana State Championship. 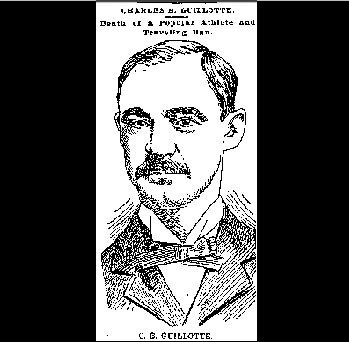 Guillotte, 28 years old, was a member of the New Orleans Bicycle Club (NOBC), formed by the first highwheel bicycle riders in the city in 1881. He was the long-standing champion rider of New Orleans. In 1884, he had defeated the American champion in the 3-mile race during the World's Industrial and Cotton Centennial Exposition. In 1887, he defeated the state champion A.M. Hill in the great Thanksgiving Day Handicap, a race from downtown to the West End, a resort on Lake Pontchartrain. Since that year, he had held the State Championship. “Babe” was ten years his junior and a member of the Louisiana Cycling Club (LCC), which had formed six years after the NOBC by younger members of that club who splintered off. While the League of American Wheelmen (LWW), and therefore the NOBC, did not allow members under 18, the LCC did not require LAW membership. “Babe” had been only seventeen when he won both the LCC championship and the Thanksgiving Day Handicap of 1890. Two weeks before his nineteenth birthday, he challenged the old champion. They would ride ten laps on the half-mile, macadam track. Although the "safety" bicycle, the chain-driven model of today, had appeared a few years earlier as a more practical mode of transportation, serious racing cyclists still competed on the highwheel, or "pennyfarthing," also referred to as the "ordinary." This race was the capstone of a four-year rivalry between the NOBC and the “Progressive Young club,” the LCC. The first contest between the two teams had been staged in 1887 at the League meet. The young team, only two months old, was routed, losing every race. But four years later, they had mounted a serious challenge to the NOBC. At the 1891 League meet, the LCC had taken 23 of 27 prizes. Now their star rider was challenging the NOBC’s star in a special match for the championship. "a magnificent diamond medal . . . It is probably one of the finest medals ever rode for. The various parts are of gold of different colors. The top bar bears the word "champion," and is crowned by a victory head supported by cherubs. The main design is suspended from the bar by heavy chains, and are caught by the extended wings of an eagle perched upon bicycle wheels. From each wheel extends a spear headed staff, bearing a pennant and each pennant holds the name of one of the contestants, The rest of the design is a large wheel flanked by dragons, and in front of the wheel is a bicycle of gold, with moving wheels, surmounted by a rider in full costume." For the first four and a half miles of the five mile race, Cason trailed Guillotte's small wheel. In the last lap, Cason pulled ahead, drawing steadily away to win by 100 yards. Cason did not have to walk to his quarters. He was carried. Guillotte lost gracefully, and he too was carried out by his friends. 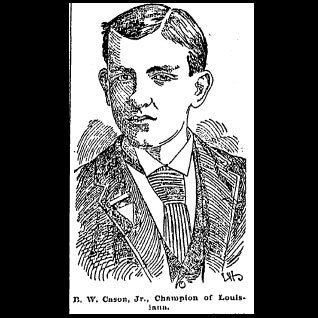 The race was reported on a full page of the Picayune, in the breathless detail of a Suberbowl post-game, with two woodcuts, one a portrait of Cason. (See slideshow.) The next year, 1892, both clubs experienced membership declines and money woes. The two clubs merged into the Pelican Cycling Club for a short while before disbanding completely. 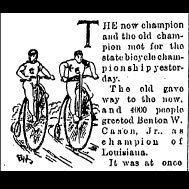 Lacar Musgrove, “State Cycling Championship of 1891, Held at the Fair Grounds,” New Orleans Historical, accessed April 24, 2019, https://neworleanshistorical.org/items/show/546.